The Rolling Hills is conceived by the promoters of Green Vistas as a one of its kind project in Kodaikanal with the cream of society in mind as potential clientele. 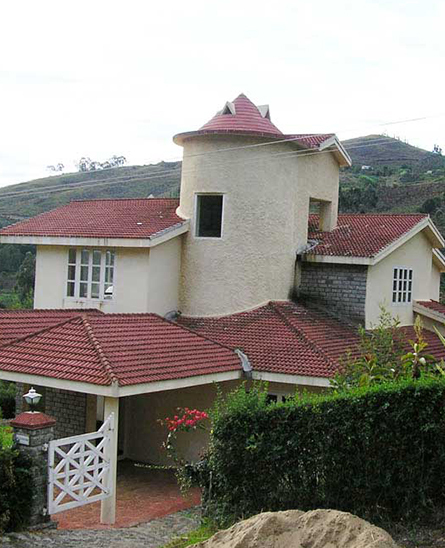 The Rolling Hills comprises beautifully designed bungalows spread over a sprawling estate of about 15 acres. It is a gated community, planned on the lines of the best in the world. It is surrounded by high mountains and nestles in a saucer shaped valley with spectacular views of water falls and the sunset. The property is encircled by gurgling streams and forest trails. Sq.ft. Range 1500 Sq.ft. to 2000 Sq.ft. Security :Common fencing, inter-com check-in facility from the main gate. Cctv/dish antenna: All bungalows will have a CCTV and Satellite TV point. Landscaping: Common landscaping will be provided. Individual landscaping on request. (There are existing fruit bearing trees on most of the property). Garden maintenance optional. Maintenance:Optional house keeping and maintenance facility. CC blocks/brickwork masonry for walls. Vitrified tile flooring for lobby, passage, and bedrooms. Plastic emulsion for internal walls. External walls in anti-fungus cement paint. Ceramic anti-skid tiles for flooring. Designer glazed tiles dado up to 7’ height. Concealed plumbing lines with superior quality C.P.fittings(Jaguar or equivalent). Polished teak wood finish front door. Enamel painted moulded panel doors inside. Waterproof panel doors for toilets. Three phase connection with concealed wiring of ISI approved brand. Adequate switches for lights, fans, air conditioning, T.V., phone points, etc. Broadband Internet and cable T.V. ready. Thoughtfully planned kitchen with adequate electrical points for all gadgets. Granite counter top with single bowl stainless steel sink. 2’ high glazed dado over kitchen top.